The day was typical for mid-July in the pine barren country of Northern Lower Michigan, hot and dry. The smell of drying sweet ferns permeated the air, and the only sound to break the midday solitude was the dull buzz of the cicadas, and the hum of the occasional horsefly. The Au Sable River flowed along toward Lake Huron like an unbroken ribbon of oiled steel. Even the canoe traffic had slowed to an occasional flotilla of parboiled fun seekers. In the shade of the stream side trees we waited for the twilight. We had fished during the early morning hours, finding an occasional brown tucked up under the protective branches of one of the numerous cedar sweepers that dominate this portion of the river, still sipping a sporadic spinner left over from the proceeding evening, or engulfing an errant terrestrial cast onto the water by an erratic breeze. It was slow and easy fishing holding only minimal expectations of finding a good fish still feeding before the heat of the day pushed them back into deeper water, or farther back beneath the impenetrable cedar sweeps. Pockets of cool air drifted out from the surrounding pine woods, the water was cool against our waders, and the sun, though increasingly warm, felt good on our shoulders. Midday belonged to the silver horde of canoeists that ply this river during the warmer summer months. Originating from canoe liveries located in Grayling and Roscommon vast armadas of these silver juggernauts descend upon the river on a daily basis, and woe to the angler that attempts to withstand this horde. The wise angler watches with amusement their antics from the bank while enjoying the relative coolness of the shade and a cold drink. Just slightly upstream from our vantage point the river took a slight bend, and on the outside edge had carved out a deep hole. In times past, perhaps spring runoff, a snag had become lodged in the middle of this hole, and for years it provided great amusement for those of us gathered in the shade during the long hot summer afternoons. During periods of normal water flow the only hint of the snag was a barely perceptible bulge on the otherwise smooth flow of the river. Canoes coming down the river would invariably drift into this snag with hilarious results, at least from our perspective. Since most of the canoeists had no idea how to direct a canoe, or how to read the water, upsets were common. Under certain circumstances a canoe would strike the snag at just the right angle resulting in the slight keel of their aluminum canoe becoming stuck on the snag without flipping the craft. Thus impaled most floaters were at a lose to explain their sudden stop in the middle of the river, or what could be the possible cause. It was rare that floaters ultimately figured out the problem, and succeed in freeing themselves without flipping their canoe. Some thought they could just jump out and pull the canoe free. The look on their faces as they plunged in, only to disappear completely out of sight, was certain to bring a rousing round of laughter from the stream side audience. It was cheap entertainment, but well worth the price of admission. As entertaining as this was it was the setting sun that really held our attention. Slowly, like a molten spot of lead, the hot July sun would edge toward the western horizon, and all attention would turn from inactive observation to active participation. The hour of the angler had arrived. Castwell and I had a routine that varied little over the several years that we fished this section of the Au Sable together. From our campsite, we would head for the river just as the sun began to touch the tops of the tallest trees. It was a short walk down the path to the river, and then upstream through a small swampy area where a tiny hidden spring produced watercress for our salads. Pushing through the alders we would emerge at a spot called Green Cabin Pool, so named for a green cabin perched on the far bank. On our side of the river a large cedar log sat parallel to the flow of the river, and it was on this log that we would sit perched like herons awaiting the evening rise we were sure would come. Thus it was on this day. We perched on our log smoking our pipes, tinkering with our tackle, and watching the water for the first telltale sign of the beginning of the evening rise. The owners of the Green Cabin were rarely in residence, but they maintained a grand piece of emerald green grass that flowed down to the very edge of the stream. Log cribbing ran along the entire length of the property, and a small log dock where canoes or Au Sable Riverboats could be secured completed the stream side motif. The end of the property was marked by a medium sized cedar tree, under which a choice brown or two often took up residence during a good spinner fall. This would be such a night. 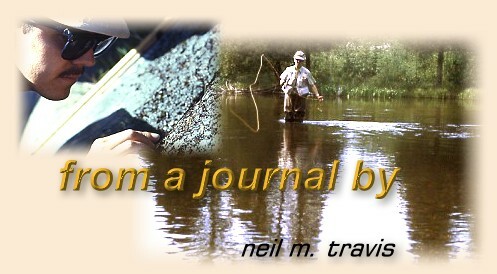 Au Sable River browns were known for their picky nature, each one holding a PHD in selectivity. This was especially true of any brown over 12 inches long, and this stretch of river held many such fish in those days. There was a goodly number of 12 to 14 inch fish, and several fish that would push 20 inches. It was these better fish that we were constantly seeking to find, and if insect numbers were heavy we could usually count on several of them making their presence known. On this night, as the first spinners began to fall, several better fish began to push their noses through the surface film. Castwell moved upstream so he could present his flies along the log cribbing where several good fish were known to set up feeding stations. I moved downstream to ply the water from the log dock downstream to the cedar tree. The spinner fall was a mixed lot of small sulphurs, a few larger drakes, and an occasional fluttering caddis. The caddis excited the smaller fish, and they greeted them enthusiastically with showy and splashy rises. As was the norm the larger and more desirable fish selected the smaller sulphur spinners, and totally disdained the larger drakes and the caddis. This type of fishing involved more watching than casting if one was to avoid spooking the better fish. Like herons patrolling the stream bank looking for an easy mark Castwell and I would move slowly up and down until we found a good fish that was steadily rising. Then we would spend several moments carefully marking the spot, and timing the interval between rises before we would make the first tentative cast. On this particular evening several good fish began to feed with uncharacteristic abandon along the entire length of the Green Cabin Pool, and extending downstream into the water below. I selected a good fish near the tail of the pool for my first attempt, and was promptly rewarded with a solid take from a wild Au Sable brown. Upstream Castwell was similarly engaged.